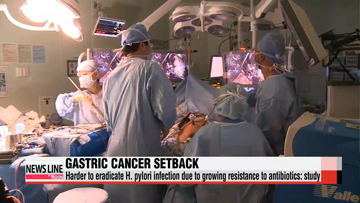 Doctors in Korea say it's becoming more difficult to effectively treat the Helicobacter py-lori infection, the strongest known risk factor for gastric cancer. A medical team at the Asan Medical Center in Seoul said Tuesday, that of the 4-hundred patients that have been given antibiotics to treat H. py-lori since last year,.. only 68-percent of them saw the bacteria have been eradicated. This is about 20-percent lower than 15 years ago. The medical team attribute the decrease to the bacteria's growing resistance to one of the two key antibiotics used to treat it. Gastric cancer, or stomach cancer, is second leading cause of cancer-related deaths worldwide.